If you haven't introduced your cat to the delights of feather toys, life's about to get ten times more fun for both of you! 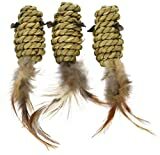 Designed to stimulate and entertain your cat, feather toys are a wonderful little gift for your very best feline friend. 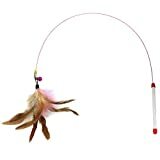 It's no secret that cats love chasing feathers, so to keep them away from ones that are attached to living creatures, get them a feather toy to fulfil that desire. Even the most reserved, elegant felines will go crazy when it's colourful feather fun time. Great for cats who are tricky to coax out of their shells and kittens who love to play, feather toys allow them to have fun while they jump wildly about, getting some much-needed exercise. So it's beneficial for your cat - but it's not half bad for you too. You'll get to enjoy seeing your pet have the time of their life chasing their new toy around. Trust us, it'll bring out a whole new side to their character you've never seen before. 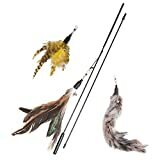 Because of the endless popularity of feather toys, there are hundreds of styles, sizes and colours to choose from. Pick out colourful feathers suspended on fish wire from a rod to dangle the feathers enticingly over furniture and quickly whisk them away. Your cat will absolutely love the endless pursuit. If you're on a budget, a basic stick with feathers attached to the end will be perfectly acceptable to your pet. Hide behind chairs and under tables and slowly slide the feather towards them then pull it briskly away to watch their hyperactive, playful side come out. Or you can opt for fully loaded feather boa-style toys. They're floaty, colourful, packed with tickle and your cat will have hours of fun pouncing as you drag it along the floor. You can also find catnip-laced feather teasers which will have your cat in seventh heaven! Not only will the colourful, tickly feathers keep their attention, the catnip will lull them into a chilled-out haze while they gently bat at their new toy. Most feather tickle toys on the market are loaded with colourful feathers so they really catch your cat's attention. 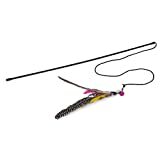 But if you want to appeal to their inner hunter, try finding a tickle toy that features earth-toned and bird-inspired feathers. Your feline friend will have buckets of fun imagining they're bringing some fowl down while they play. 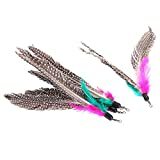 Feather toys are not only good fun, they provide fantastic stimulation for your cat too, stretching their physical and mental abilities while they play. When bringing a shy new kitten home, a feather toy can be a great way to bring out their lust for fun and help you bond with each other. Or, if mean old Mr Vet has informed you that your cat could do with shedding a few pounds, a feather toy is guaranteed to get even the laziest cat up and at 'em for playtime.